Web site development and maintenance, Flightworld American Express and Cruiseworld American Express, Perth. Multi-media production for Meeting of Associates of Srs of St Joseph of the Apparition, in Rome. 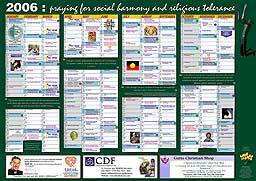 Calendar and Year Planner for the Archdiocese of Perth. 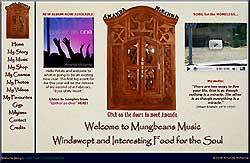 Click here or on the image to see larger scale version and also the other calendars in the series 2000-2006. Printed size A2 (420 x 594 mm). The BIG red coupon book is a marketing initiative for small businesses in local areas covering about 10,000 homes. Email and web-based marketing for Lasalle Watches, Perth. Multi-media for Knights of the Southern Cross (WA) Inc. 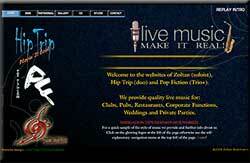 The www.catholica.com.au website also contains many recent examples of multi-media productions. Email & hardcopy newsletter for Congregation of the Christian Brothers, Holy Spirit Province, Western Australia and South Australia. Current email issue can be found here. 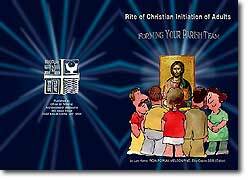 Design and layout for book for the Office of Worship, Archdiocese of Melbourne. Jubilee 2000. 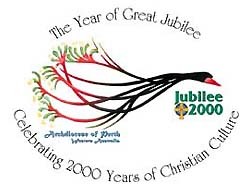 During the year 2000 I was extensively involved with promotional endeavours for the Great Jubilee of Christianity in the Catholic Archdiocese of Perth. 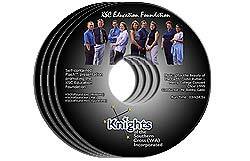 Click here to see a record of some of the initiatives I developed or helped develop.